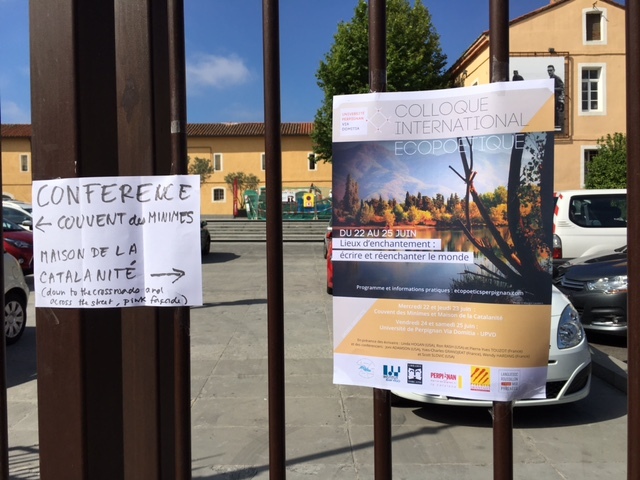 Almost 53 years after Salvadore Dali referred to Perpignan as the ‘centre du monde’, the French/Catalan city nestled ‘twixt the Pyrenees and Mediterranean, hosted a gathering of 100 delegates representing 20 different nations at ‘Ecopoetics Perpignan: International Conference on Ecopoetics, 22-25 June 2016’. 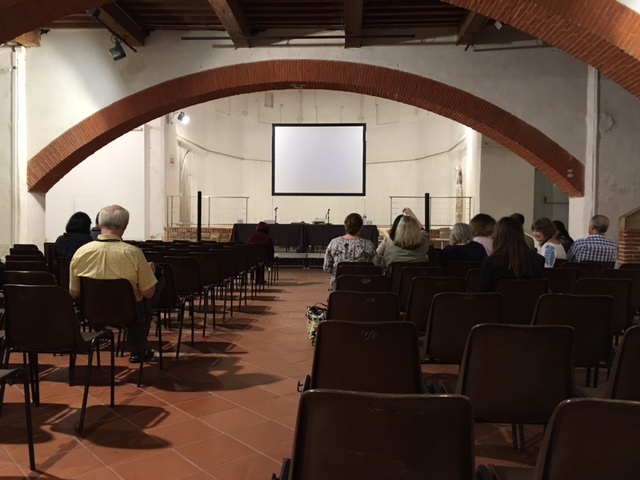 The Conference welcome and registration on Wednesday 22nd June, was located in the suitably grand location of the Couvent des Minimes where delegates gathered in expectation. Conference organiser Prof Benedicte Meillon was joined by the Head of Research of the host institution L’Université de Perpignan Via Domitia (UPVD), and by a representative of the city’s mayor. The latter noted that Perpignan was pleased to welcome its second major academic conference of the year, which like the first was being opened up to the public so that research can reach beyond the boundaries of academia. Conference papers were presented across the spectrum of ecocritical positions, taking in deep ecology, marginalised cultures and indigenous non-Western perspectives, spiritual ecology, ecofeminism, environmental justice, rewilding, and living in the Anthropocene Age. Most of the speakers were international postdoctoral researchers and professors. The PhD students accepted to present represented institutions from Belgium, USA, Australia, Wales, Estonia, Switzerland, India, Germany, England and from across France. Papers were presented either in English or in French. On Friday the conference moved from Couvent des Minimes to UPVD’s campus. 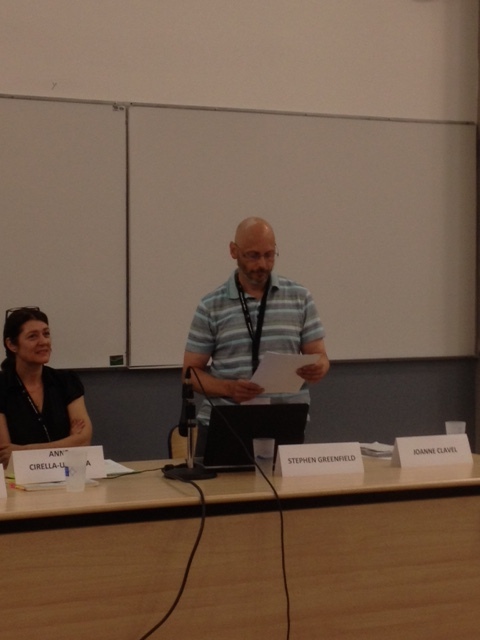 It was here that I presented as a member of Panel 19 which was chaired by Joanne Clavel, Museum d’Histoire Naturelle. My fellow presenters were Anne Cirella-Urrutia, Adjunct Professor at the University of Huston-Tillitson, Austin, USA (“Places of Memory and Memory of Places in bande dessinée: Re-Enchanting (Sub)urban Spaces in Davodeau & F. Jacquet’s Jeanne de la zone (2014) and Guy Delisle’s Shenzen (2000).”) and Esther Laso y Leon, Professeure à l’Université d’Alcala, Madrid, Espagne (“ Quand les ogres et les princesses s’inquiètent de ce qu’ils mangent : détournement écologique des contes.”). My contribution focused on Tolkien’s representation of trees in The Lord of the Rings to articulate the struggle between an enchanted ecological authenticity and the threat of a fallen world. Tolkien’s trees recycle mythology to represent ecology as a mythological and cosmologically iterative divine system. I argued that through his use of trees Tolkien underlines the deep ecological subtext of The Lord of the Rings that reaches beyond the shallow environmentalism of the Ring narrative. As a result the book conveys a profoundly ecological message of hope. Following a break for lunch the conference reconvened with a sobering account of the Anthropocene in Professor Wendy Harding’s keynote. Wendy’s keynote included the shocking images of cyanide lakes in North America, as one of the largely ignored consequences of transformative human engagement with its environment. The seminar highlighted the importance of ecocriticism in the foregrounding of hidden ecological and environmental perspectives in literature. This entry was posted in Conferences, Reseacher Profiles and tagged deep ecology, Ecopoetics, environmentalism, J.R.R. Tolkein. Bookmark the permalink.